Welcome back to another Merry Monday! 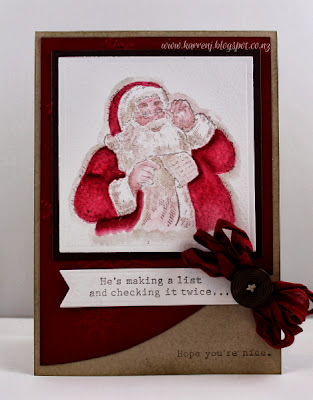 Today's challenge is a fun one, not to mention pretty simple - Use Santa on your Card. I stamped him onto Watercolor Paper using Brown Stazon stamped off once. 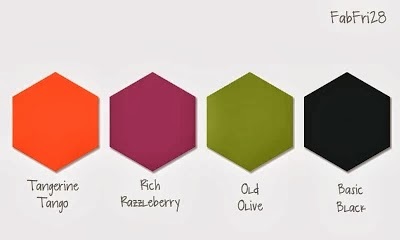 That gave me a lighter image that made it easier to colour with inkpads and blender pens. Once I had the image colored using that method, I went over the shadowed areas with a marker then blended using the blender pen. I used a touch of Crumb Cake ink on his fur and Sahara Sand on his beard. His skin was colored using Blush Blossom and a touch of Pool Party colored his eyes. I used an older Fusion sketch for the layout and tried to mimic my team-mate LeAnne for the shabby bow. Thanks for looking. Now go check your stash for a Santa image and play along! Anyway, I did sneak into the craft room for a while this morning and made a card to cover three challenges - Just Add Ink which is Just Add Grunge; Create with Connie & Mary's color challenge and the sketch at Pals Paper Arts. Raspberry Ripple and Soft Sky look so pretty together. 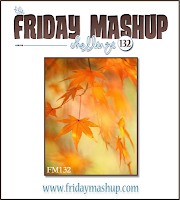 I grunged up both colors as well as the DSP using Gorgeous Grunge. Then I wanted to put a flower on the card but didn't want it to look too pretty, being as it was a grunge card of course! So I made my own flower using Hemp Twine and a Designer Builder Brad. 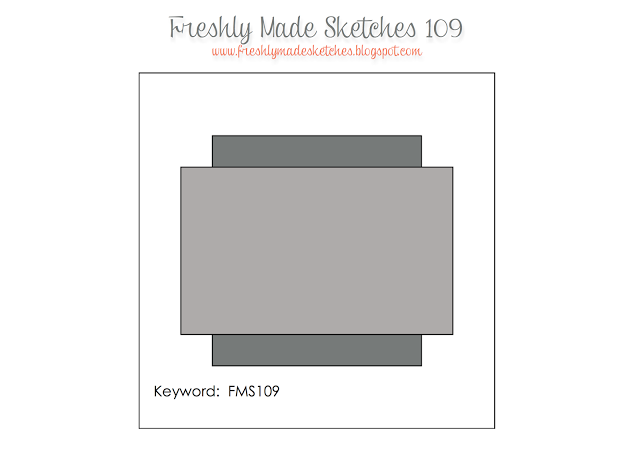 The center of the brad is also grunged-up Soft Sky cardstock. 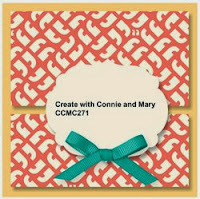 Edited to Add: This card was chosen as an Artists Pick at Pals Paper Arts. It's Sunday morning here and I finally managed to get a card made. My Saturday afternoon is my usual stamping time, but I spent the time yesterday cataloging all the stamps I've bought since 2011. Whenever I buy a set, I photocopy the image sheet and write on the copy the price and which category it belongs to, then file it in a binder. Well for the last two years, I'd been doing the photocopying like a good little girl, but hadn't been finishing the job! 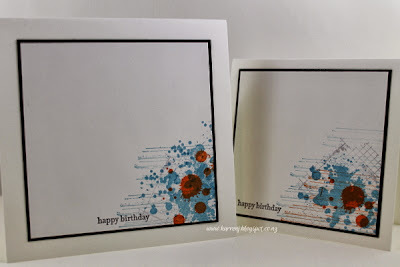 So yesterday, I categorised 222 Stampin' Up sets and about 40 non-SU sets. Anyway, on to today's card. 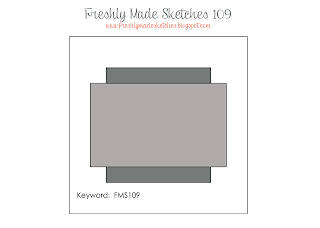 This uses the sketch at Freshly Made Sketches this week. 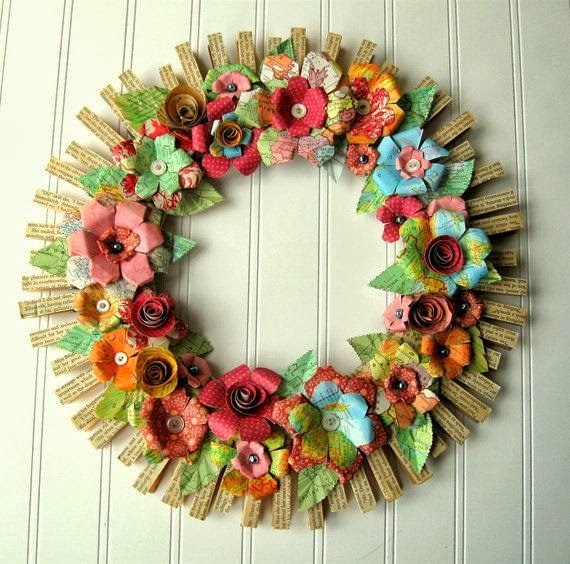 I found these gorgeous paper flowers and matching strips at a big discount store yesterday and just had to use them today. 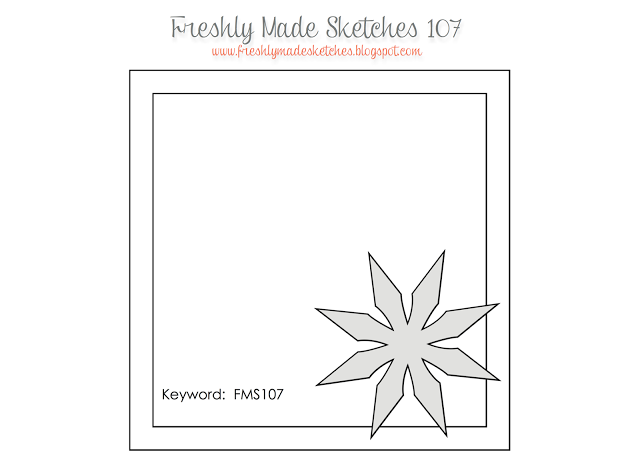 I really, really wanted to distress and grunge up the card a bit, but that doesn't fit with the FMS concept, so I kept it clean. These layers really look crooked, but trust me, it's because the embossing folder on the card base is on an angle (designed that way!). 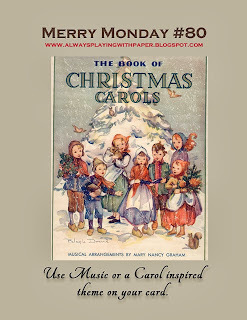 But it really bugs me, so I might have to re-make this without the embossing. 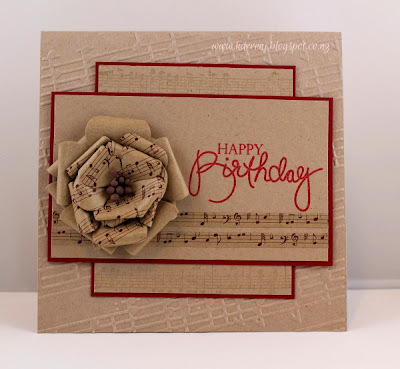 The bottom layer has the Music Notes wheel rolled across the top and bottom in Crumb Cake ink and the top layer has the sentiment embossed in Cherry Cobbler. The challenge at Merry Monday this week is this beautiful vintage picture of carollers. 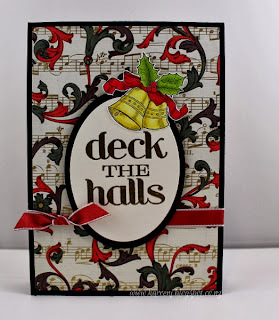 I used the music theme as well as the Deck the Halls sentiment from Christmas Messages. 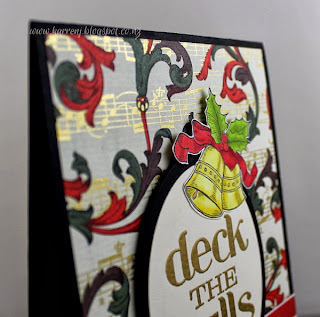 I gold-embossed the sentiment onto Very Vanilla cardtock then cut out into an oval shape. 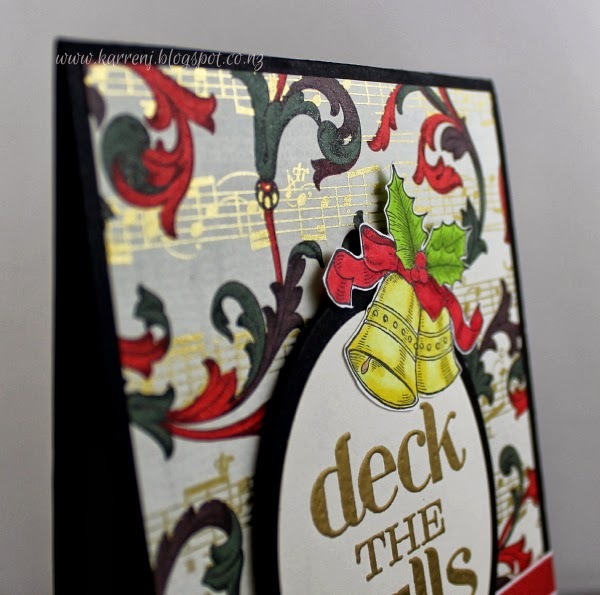 The bells from Bells & Boughs were stamped and colored with Copic markers. The DSP is one I've had since I first started stamping way back in about 2001 and this is the first time I've used it (NBUS)! I don't even know who produced it as it has no name on it. 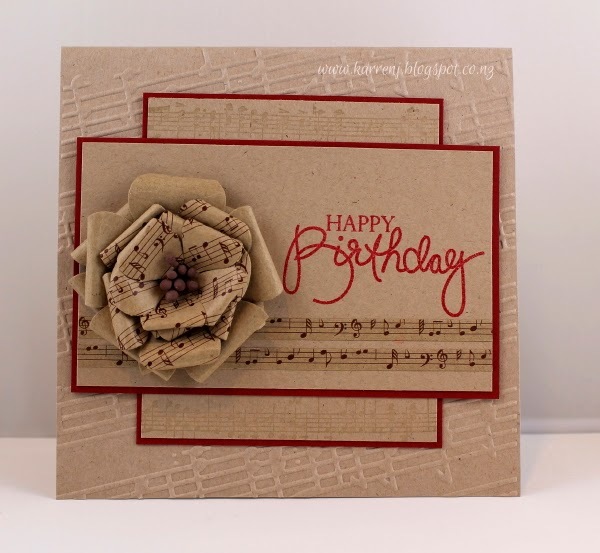 Here's a close-up of the gold music notes. 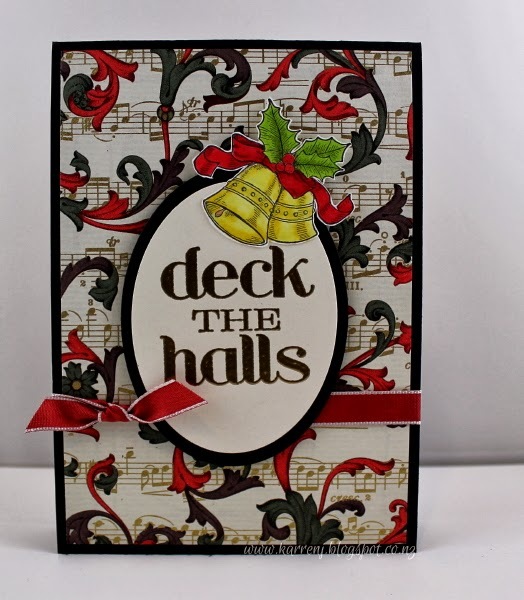 Head on over to Lesley's blog and check out the rest of the design team cards. 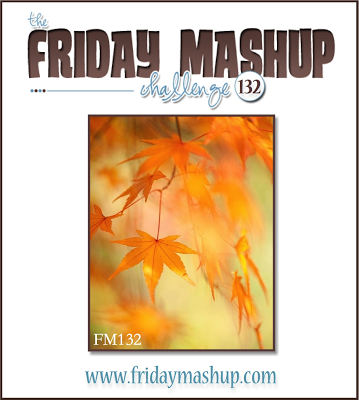 I can't wait to see all the entries! Firstly, I need to apologise to the Dynamic Duos team. 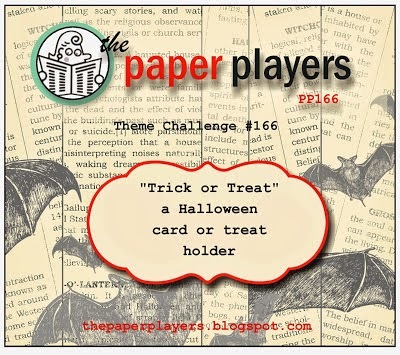 I saw the challenge this morning and went off to make my card. 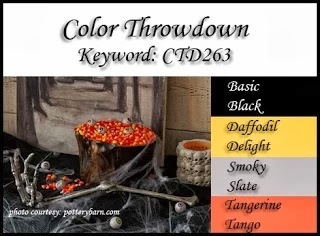 However, I thought the challenge was Pumpkin Pie and Basic Black. 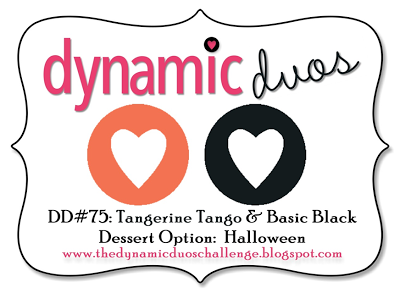 I really, really wanted to use Tangerine Tango, but told myself "No, stick to the challenge colors" doh! 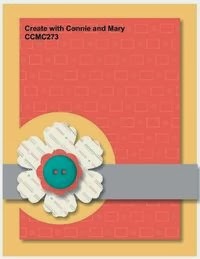 I do think this card would look better in Tangerine Tango but it is what it is. That'll teach me that at my age, I really should write things down rather than rely on my memory! Anyway, onto the card. 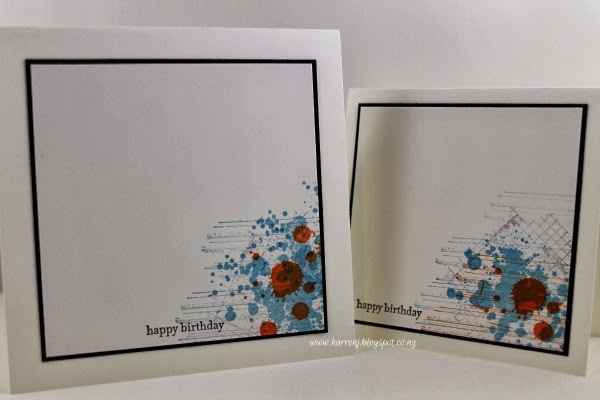 I finger-walked the Dictionary stamp onto Very Vanilla cardstock, using Crumb Cake ink. I then over-stamped with a couple of the spatter stamps from Gorgeous Grunge. The circular panel was made by stamping the leaf from Faith in Nature (after I mounted it - NBUS!) in Black Stazon onto watercolor paper. I then dripped water onto the paper and swirled Pumpkin Pie ink over until I was happy with the result. Once it was dry, I lightly sponged the edge in Crumb Cake ink and mounted it onto a scrap of Faux Suede Pumpkin Pie cardstock that I'd had in my scrap folder forever. I wrapped some Early Espresso Baker's Twine around the vanilla layer (oh how I wish that came in black!) and then stamped and cut the sentiment to fit under it. I don't know if leaving the circle over the edge of the card is quirky or dorky, but decided to leave it as it is. It's been a long six days since I've last stamped! I went back to work after my week off and it was hard going LOL. But it's now the weekend and in between spring-cleaning the kitchen and doing laundry, I managed to make a card. 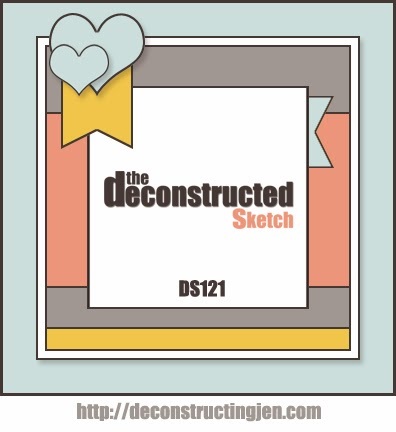 I used the colors from ColourQ and the sketch from Freshly Made Sketches for my card today. 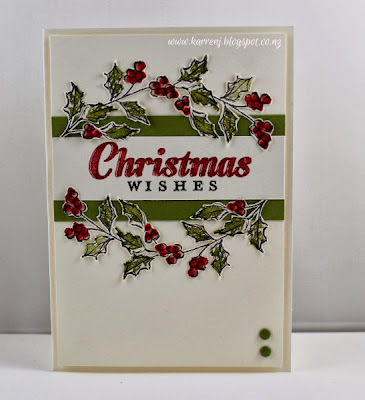 The main panel is stamped using Mum's the Word set and Strawberry Slush; Pumpkin Pie and Lucky Limeade inks. 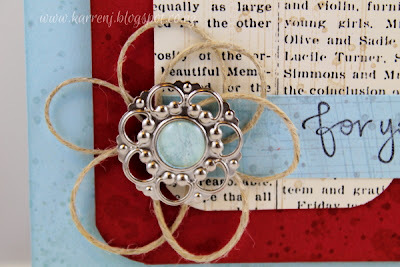 Over top of that, I stamped the doily from Love Doily in Illuminate ink. 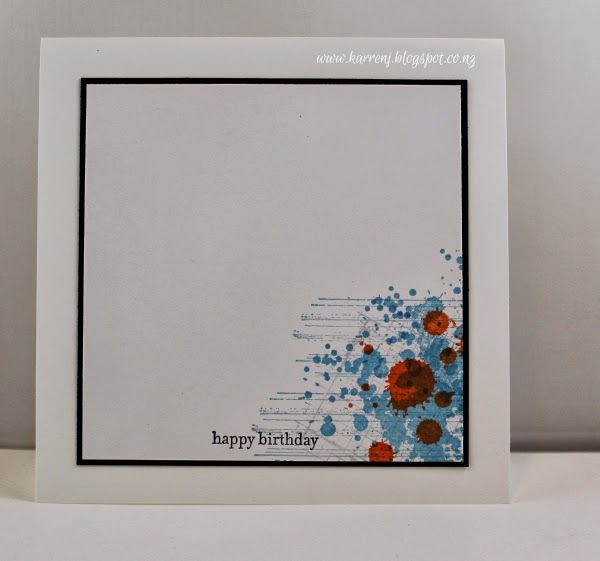 I also stamped the doily onto the card base using Illuminate ink. The panels were layered onto Lucky Limeade cardstock, cut 1/16" bigger to provide a tiny mat. 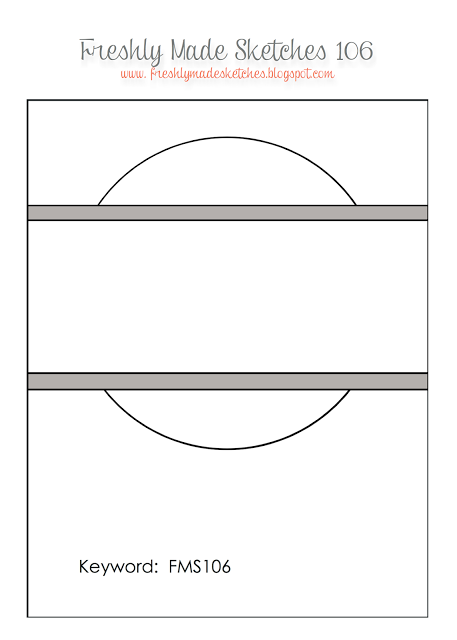 The word "thank you" is also from PTI and acts as the horizontal panel in the sketch. Instead of banners, I used a Strawberry Slush butterfly and a Pumpkin Pie heart. Edited to Add: This card received a Courtier Award at ColorQ. I popped into my craft room to make one last card before I head back to work tomorrow. 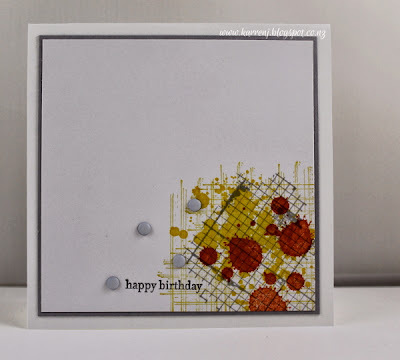 Yesterday I posted a card for the Just Add Ink inspiration challenge. 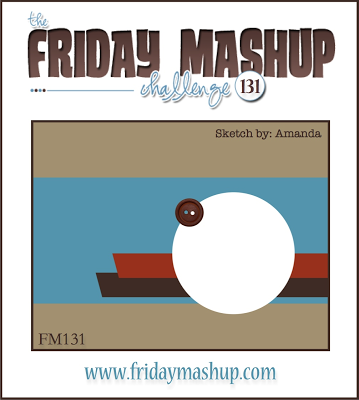 Well, here's another one for the same challenge and this time I've also used the sketch from Friday Mashup. Disclaimer: I know next to nothing about plants, so I'm guessing this is a dogwood. 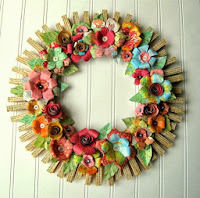 Again I used the flowers and the text from the inspiration pic and this time there is the bonus of the circle element. 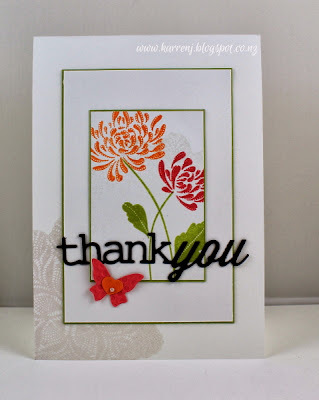 I stamped the flower from Happiness Shared onto watercolor paper and colored it using inkpads and aquapainter. 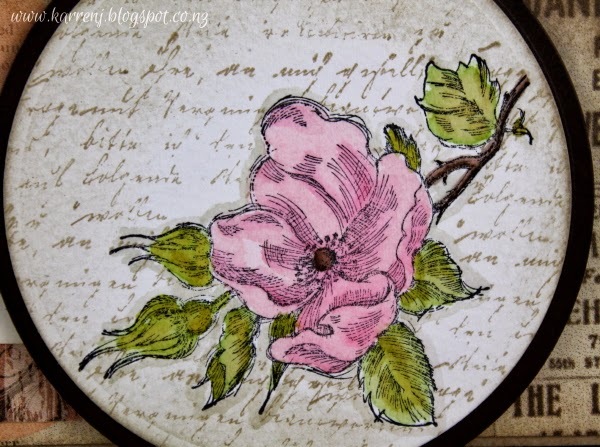 I then masked the flower and over-stamped the text from Notable Notions in Crumb Cake ink. The DSP is from Soho Subway and the sentiment is from Express Yourself. I embossed the card base with Pretty Prints EF. 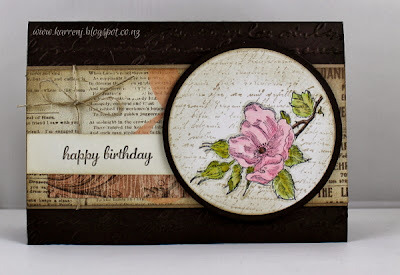 All the layers were sponged with either Crumb Cake or Early Espresso ink to give a vintage look to the card. Well, my week's leave from work is almost over (sniff!) and it's back to work I go on Monday. 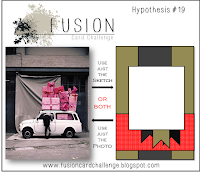 In between loads of laundry today, I managed to make a card using the current Fusion challenge. 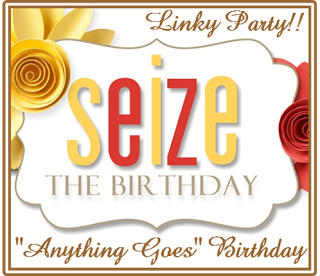 I'm also linking this to Seize the Birthday as this is a birthday card for my niece who will be 8 next month. 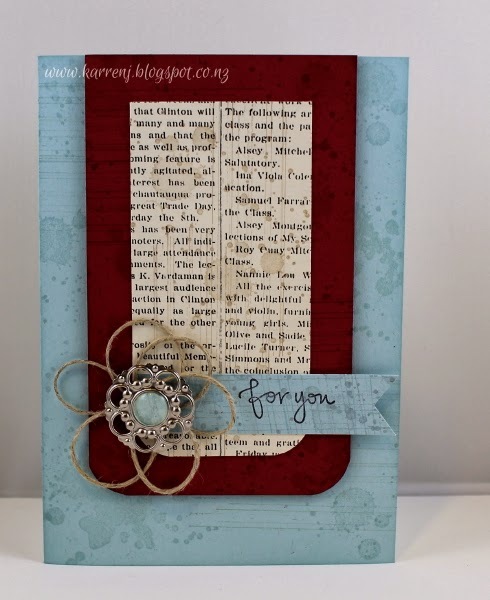 I used the inspiration photo at Just Add Ink for the flowers and text background, so I'm linking their as well. My niece, Jordan, does ballet (don't all little girls?) so I hope she likes this card. I used a 2003 Stampin' Up set called Dance Sketches. I love the sketch sets they brought out and have quite a few of them. I colored the image using Copics because I just can't get the Marker Layering technique to work on Whisper White. No matter how light a touch I use, I get pilling, so I think I'm going to give up on that technique and when I want to use a white base, I'll go with Copics. 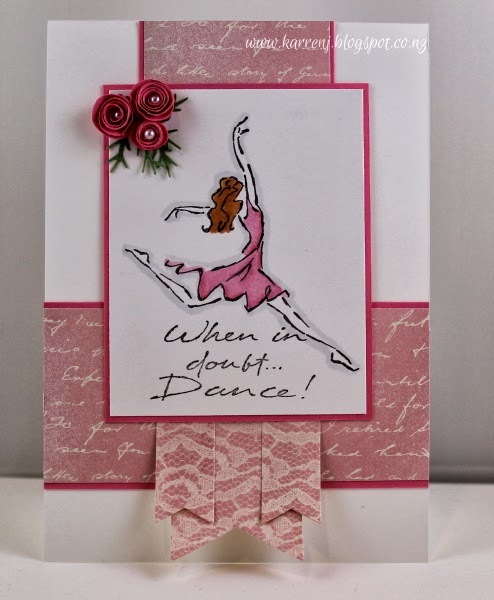 I used Regal Rose and the Fan Fair DSP as my pinks. I made some tiny little rolled roses using 1" and 3/4" circle punches and tucked a pearl into the center. I see now that when I re-drew the card sketch onto scrap paper I didn't get it quite right, but I hope it's close enough to pass muster! This image and it's accompanying sentiment always crack me up. I used some DSP from More Amore as well as the In Color DSP. I used the sketch from Deconstructed Sketches for this card. As mentioned in my earlier post today where I showed my Papa and Baby cards, here is my Mama card. 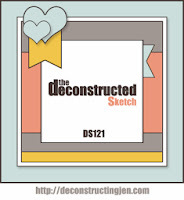 Again I used the sketch at Freshly Made Sketches, but I'm not linking it up as it's too similar to my earlier cards. This time I used the colors from Color Throwdown and because it's more of a feminine card, a few embellishments were in order, hence the Candy Dots. 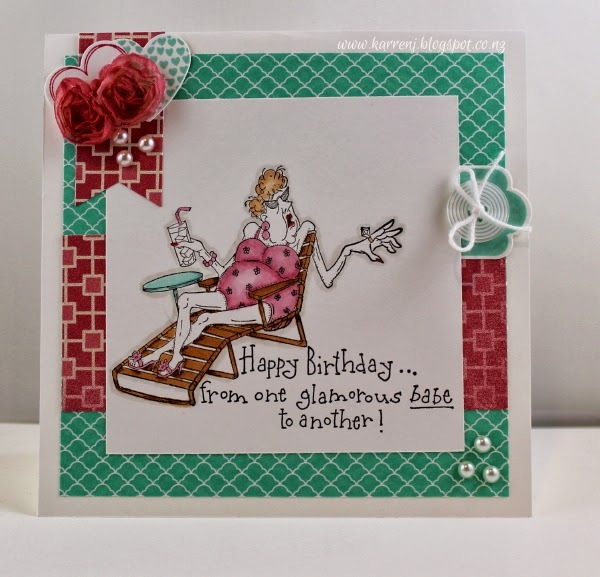 As soon as I saw the cool sketch at Freshly Made Sketches this week, I wanted to use Gorgeous Grunge and make a masculine card. 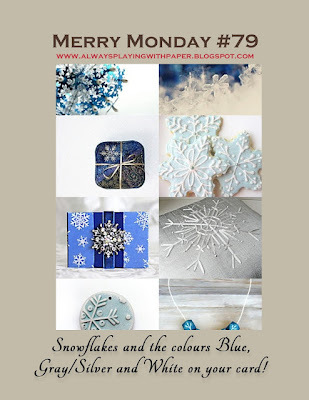 I love square cards and I cards with images off the edge! This sketch is a match made in heaven! In fact I love this sketch so much I made two cards - not intentionally - but my first card looked too big so I made a sized-down version as well. 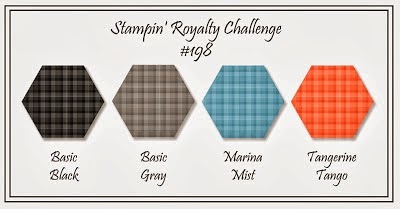 I combined the sketch with the colors at Stampin' Royalty and the Masculine theme at SUO Challenges. 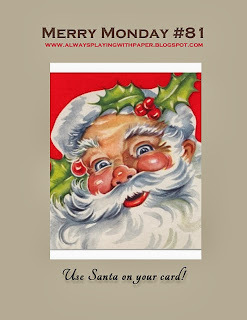 Here's the Papa card - he's 5" square. 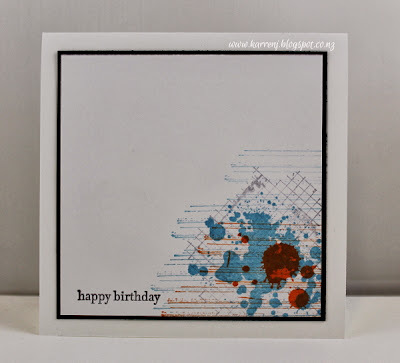 I stamped Off the Grid in Basic Gray stamped off twice, then over-stamped with various images from Gorgeous Grunge in Marina Mist and Tangerine Tango. 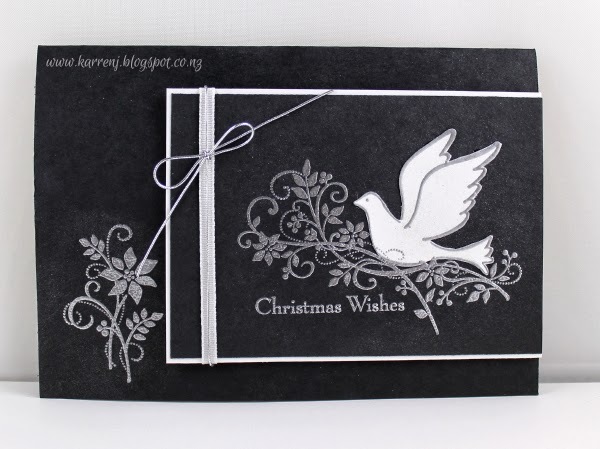 The sentiment from Teeny Tiny Wishes is stamped in Basic Black. Now here's the Baby version. I actually like the proportions of the baby card a bit better. 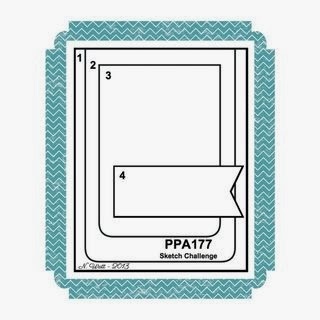 This card is 4 1/8" square. Here's a photo of them both together. 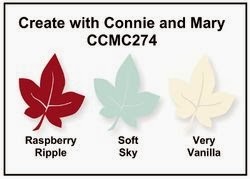 I think I might go make a Mama card now using this week's colors from Color Throwdown LOL. Over the next month, two of my three sisters have birthdays. Today I made a card for one of them (not sure which one, yet!). I used the colors from Just Add Ink for my card, which also uses the new Circle Thinlits. I've been waiting and waiting for SU to introduce them to the NZ market, so a very good friend of mine in the US sent me both the Circles and Labels sets for my birthday. Today is the first chance I've had to try them out. ETA: I just logged onto the SU Demo site and these are going to be available in NZ from 22 October! These cards are a 'mare to photograph so I took several photos. This first one is the card closed. 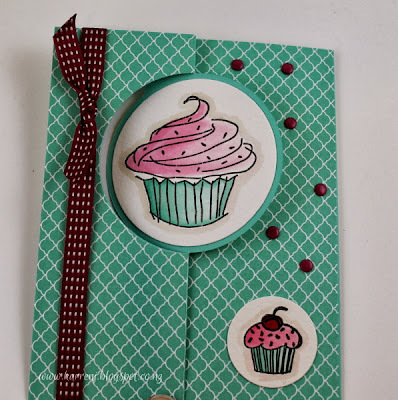 I used an Inkadinkado set for the cupcakes which I colored using refills and an aqua painter. It's been quite a while since I colored with an aqua painter but I wanted a very watery look for the Raspberry Ripple icing otherwise it would have looked sickly :) The small cupcake has the Raspberry Ripple watered-down and the Raspberry Ripple full strength for the cherry - so you can see the difference! The candy dots are actually Rose Red but they are close enough to pass for Raspberry Ripple. Here is a photo of the inside. 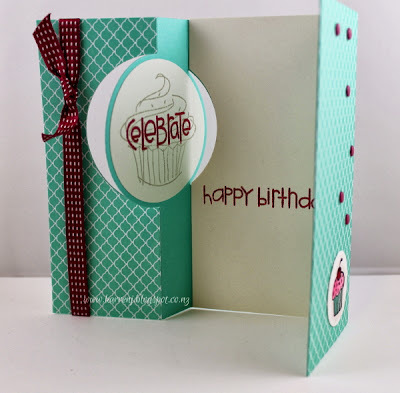 I used some NBUS on this card, which is a Paper Smooches set I just received on the weekend. 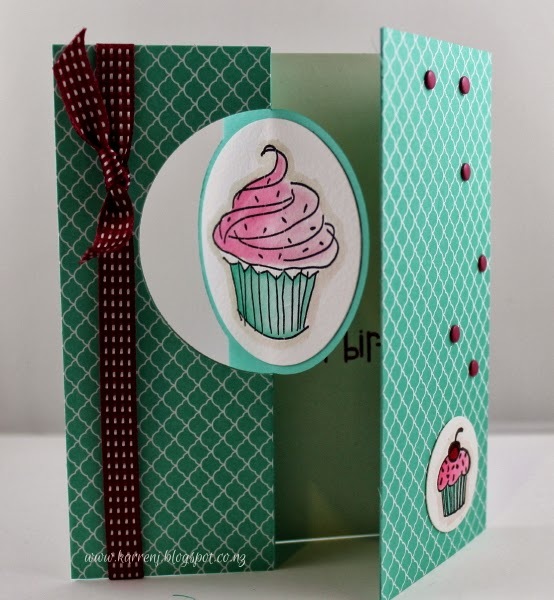 For the circle element, I stamped the sentiment in Raspberry Ripple, then over-stamped the cupcake in Sahara Sand. And another photo just for the fun of it! 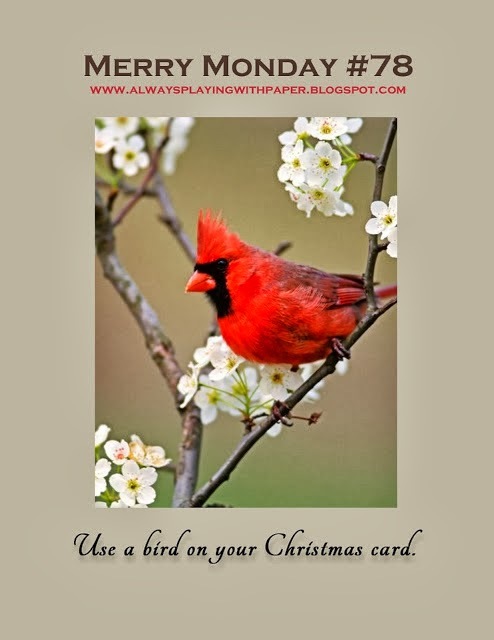 Use a bird on your Christmas card is this week's challenge at Merry Monday. I pulled out Gifts of Christmas set which has an elegant dove. I silver embossed the main image on both Basic Black and Whisper White cardstock. I cut out the dove from the Whisper White and spritzed it with Platinum Frost Shimmer Mist. It's really shimmery IRL, trust me! I don't have any silver ribbon so I compromised and used white narrow grosgrain and some silver cord. Thanks for looking. 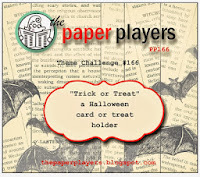 Check out the rest of the DT cards and hunt through your stash for a bird stamp to make your own challenge card. Notice how Loll used the same image but in a completely different way? Today is the first day of my week long stay-cation. Unfortunately I had to spend most of this morning with a flood clean-up company as they positioned multiple fans and dehumidifiers around our house to try and dry out the damage from Friday night's burst pipe. The noise is rather loud and poor wee Dexter-Dog can't go to his room (the laundry) so he's feeling a bit lost. Tomorrow they'll come back to check how effective the equipment is and hopefully at some stage an insurance assessor will come round and tell us what's going to happen to repair the damage. Enough of that - it's time for a card. I made a Halloween card today. Now I don't celebrate Halloween but I had to buy the sets Best Fiends and Just Between Fiends because I just love the artwork. Never knew if and when I'd use them, but today they came in handy for this card. 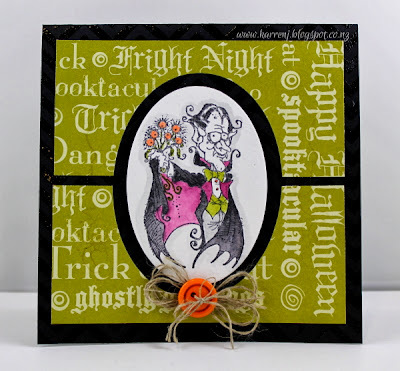 I used the sketch from Create with Connie & Mary; the colors from Fab Friday and the Halloween challenge from Paper Players. Yesterday I made a card for this week's sketch at Freshly Made Sketches. 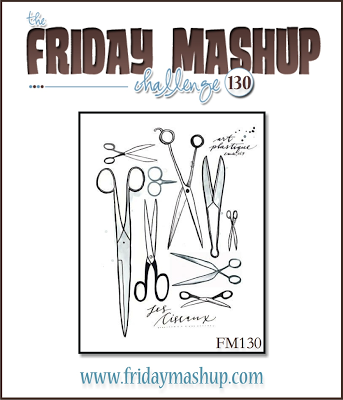 I also combined the fussy-cutting challenge at Friday Mashup. I'm not really feeling this card, but I was a bit distracted yesterday. We woke up to a burst pipe in one of the upstairs showers, so water had been steadily leaking down the walls into the laundry, garage downstairs and the floor of my son's bedroom adjacent. I've got this week off from work because it's school holidays but I have a feeling that instead of spending it relaxing and stamping, I'll be spending it working through an insurance claim! 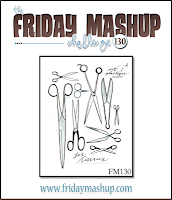 Despite that, I found the fussy-cutting therapeutic and calming. I'm one of those weird people that doesn't mind fussy-cutting. 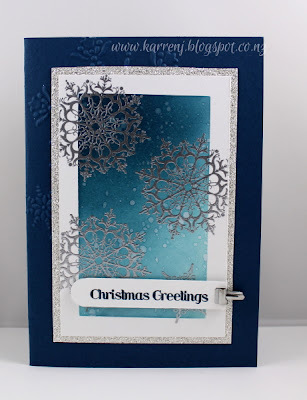 This is possibly because when I first started stamping, I did all my fussy-cutting using a craft knife, so using paper snips now makes it a doddle LOL. 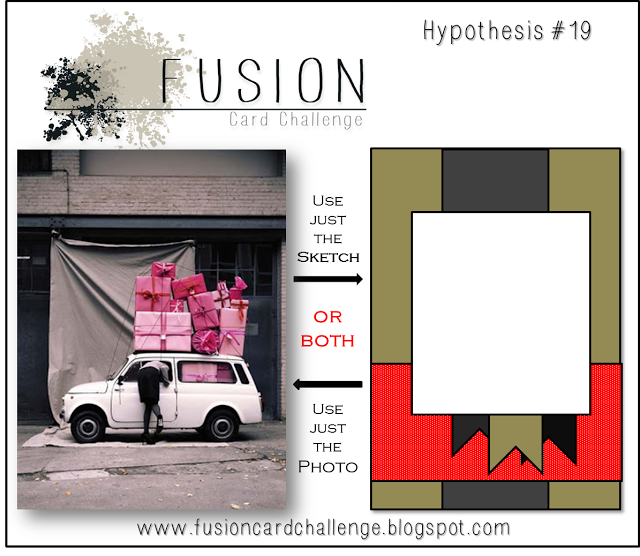 Anyway, it took me 8 minutes to cut each of the four images used in this card (just some trivia thrown in there!). 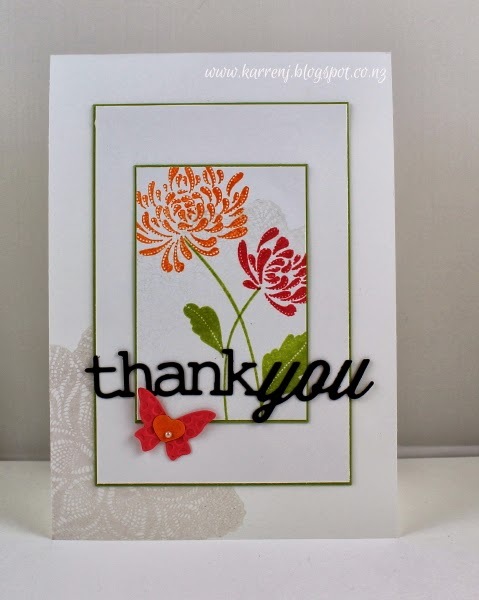 Edited to Add: This card was awarded the Queen of Clean Award at Freshly Made Sketches!